Get Jim’s FREE eBooks Here!! ALL of Jim’s eBooks are FREE at His Bookstore!!! Released in December 2017, “Thanksgiving Praise & The Names of Jesus” is available for purchase in Paperback for the upcoming Holiday Season! Better yet, the eBook version can be downloaded FREE at Jim’s Bookstore. This is the fourth book in Jim Davenport’s series of Christian Devotions and Quick Studies. 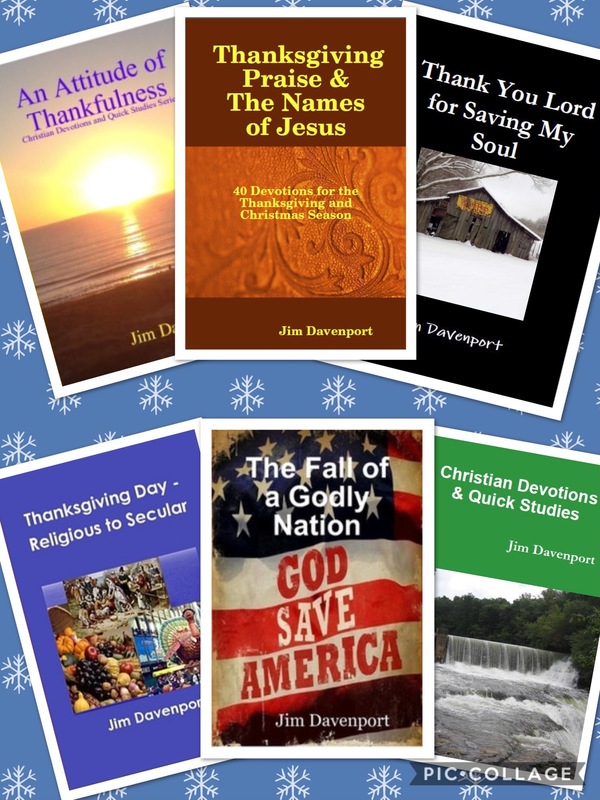 Included are 40 Devotions suitable for the Thanksgiving and Christmas Season. Twenty devotions relate to the Thanksgiving season and lead the reader to an attitude of Thanksgiving and Praise. An additional twenty devotions enhance the celebration of Christmas by focusing on the Biblical names attributed to Jesus. Each of the devotions is suitable for a daily family devotion or a small group study. Some of the individual titles in the Thanksgiving Praise section include: How Majestic is Your Name, How Great Are Your Works, Sing to the Lord with Thanksgiving, Whatever You Do … Give Thanks to God, Rejoice Always, Jesus Gave Thanks, and Be Generous in Every Way. Those in the Names of Jesus section include: Immanuel – God With Us, The Good Shepherd, The Alpha and The Omega, The Last Adam, The Lion of the Tribe of Judah, Lamb of God, and Bread of Life. The lead article in “Thank You Lord for Saving My Soul” provides unique insight into the lives of Seth and Bessie Sykes, evangelists and song writers of the song “Thank You Lord for Saving My Soul.” Other topics include the sufficiency of God’s grace, His purpose for man’s creation, His role as comforter, His strength and His faithfulness. A number of articles relate the story of how the brief life of the author’s great grandson and that of his parents had such a significant impact on so many lives. Several articles resulted from the author’s personal life experiences including the emotions involved in moving on from a loved home and lifetime church. Other articles touch on heroes of the bible, a debt you can never pay, Paul Harvey’s radio broadcast of “If I Were the Devil,” and experiencing the indwelling life of Christ. This is the third in a series of books by Jim Davenport dealing with the general topic of Christian Devotions and Quick Studies, which was the title of the first volume. The second volume is An Attitude of Thankfulness. The twenty articles contained in this book cover topics close to Jim’s heart including: thankfulness, thanklessness, the Christian’s attitude, strength from God in the times of need, the sanctity of life and marriage, the consequences of our sin, praying with confidence, class warfare, and God’s presence in our lives. One article recalls the Pine Lake Baptist Church fire and how God used that tragedy to further His purpose throughout the world from the small town of Stone Mountain, Georgia, USA. This is the second in a series of books by Jim Davenport dealing with the general topic of Christian Devotions and Quick Studies, which was the title of the first volume. The Bible teaches that the fall of Israel and Judah as once Godly nations resulted from their own continued sinfulness and disobedience to God’s commands … not from the strength and power of their enemies. In this book the author focuses on a portion of the history of Israel and Judah stretching from 750 BC to 586 BC and in particular the leadership of King Hezekiah and his son Manasseh. Parallels are drawn between the sinfulness of Israel/Judah and modern-day America. Topics covered include the positive reforms of Hezekiah such as the revival of the worship of Yahweh; the building of Hezekiah’s Tunnel; the lies, intimidation and blasphemy of Assyria’s King Sennacherib; Hezekiah’s illness unto death and his miraculous recovery; the consequences of Hezekiah’s pride; and the failure of Hezekiah as a Godly father in rearing his son Manasseh. The final chapter deals with what will be required for God to Save America from a similar downfall. In what now seems to be the ancient past, many of the early Europeans who risked their lives to settle the lands of the Americas were dependent on God and openly thankful for His blessings. The celebration of a day or season of Thanksgiving was a religious observance accompanied by worship, prayer, a hearty meal and a community attitude of thankfulness. In modern times the day or season of Thanksgiving that started in the colonies as a religious observance has transitioned over time to a primarily secular long weekend spent with family and friends while over-eating, watching football and shopping like crazy. This book traces the history of how the celebration of Thanksgiving in the United States of America has changed from the time of the Pilgrims in 1621 to the Presidency of Barack Hussein Obama in 2012. This book is a compilation of selected articles and devotions on a variety of Christian topics. Some touch on items of importance to the local church such as how to deal with rumors and gossip, the Biblical pattern for giving, the comparison of givers and takers, harboring grudges, and the proper order for worship. Many of the articles provide advice to the individual Christian on their daily walk with God including such topics as lifestyle choices, the sanctity of life, changes brought about by the salvation experience, how to deal with fear, facing tough times, being a friend, and making right choices. Several articles touch on Islam with one providing a basic comparison to Christian beliefs. Others address the nature of God, the gift of Jesus, and the believer’s sufficiency in Christ. Not everyone will appreciate the author’s point of view, but his purpose is to make you think … and in particular to think about and strengthen your relationship with the Lord Jesus Christ. Once you have read one of my Paperback books pass it along to a friend. Since my eBooks are available for FREE, please encourage your friends to visit my Bookstore and download them to their computers and eReaders. Let’s spread the encouraging message of salvation and eternal life through Jesus Christ to as many people as possible!